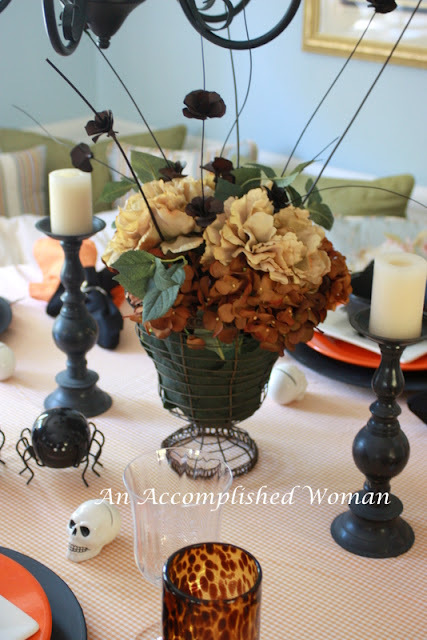 An Accomplished Woman: Misty Halloween or the most awesome Halloween table ever!!! 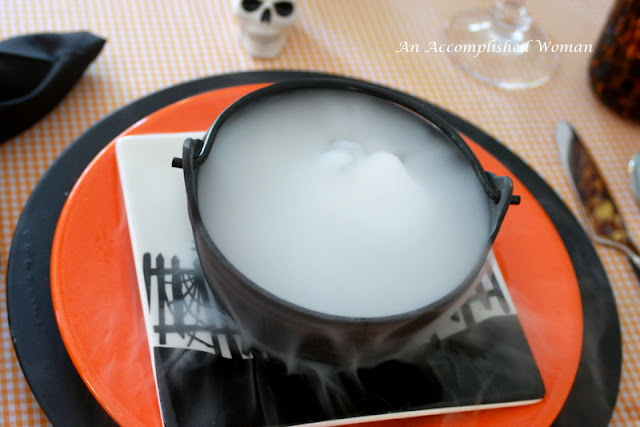 Misty Halloween or the most awesome Halloween table ever!!! Several weeks ago, I was innocently strolling through World Market and came across the most fantastic bowls. Heavy, metal bowls with handles that are perfect for chili with a cornbread crust… Imagine beef stew, breakfast casserole and the list can go on. 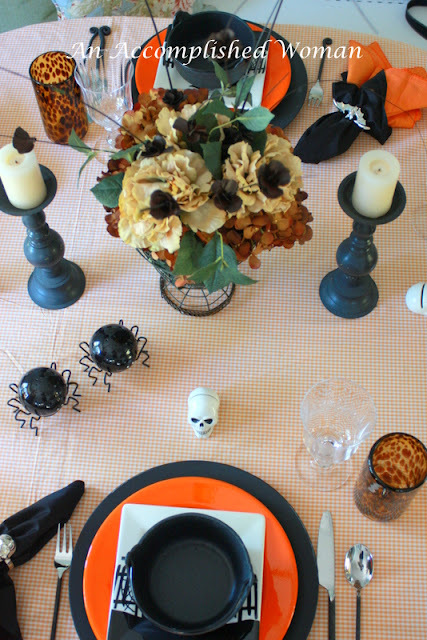 Let’s look at my Halloween table, first. 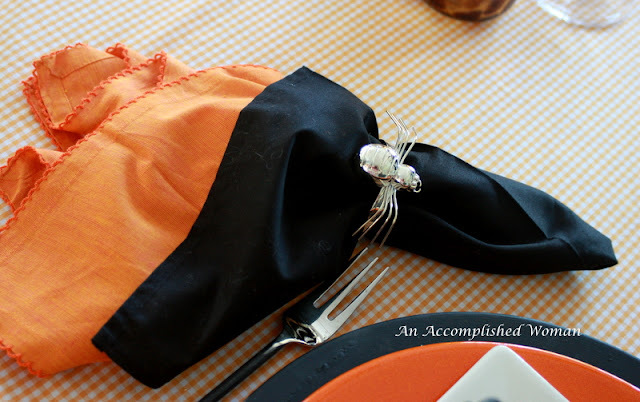 The sweet gingham tablecloth I made and used here. 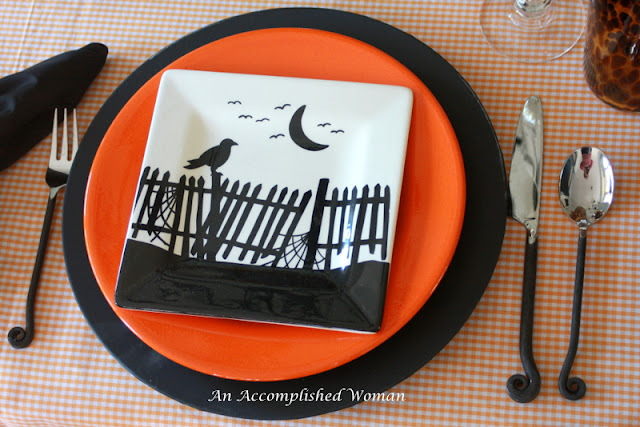 Love the orange plates with my Kroger Halloween plates. They were a great bargain last season. It took us three Krogers to find 10 of them. Old gold chargers that were painted with chalk paint. I used them in this table. They are perfect. 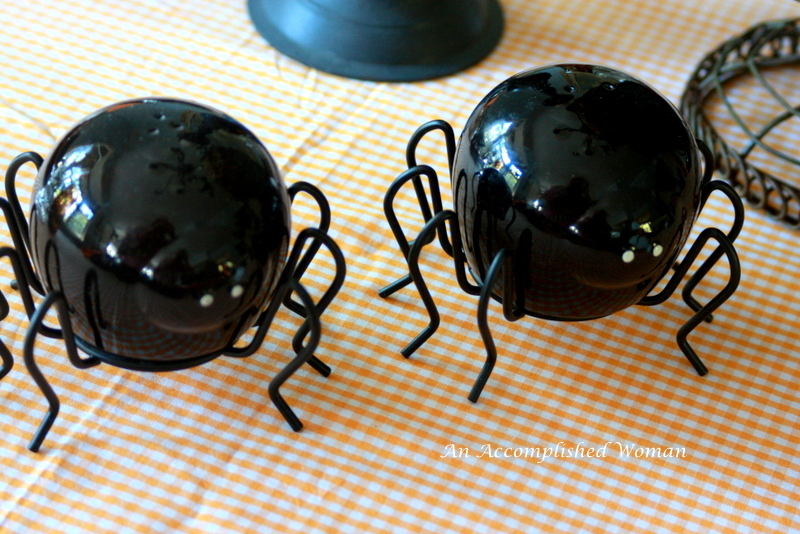 Love the spider salt and pepper. 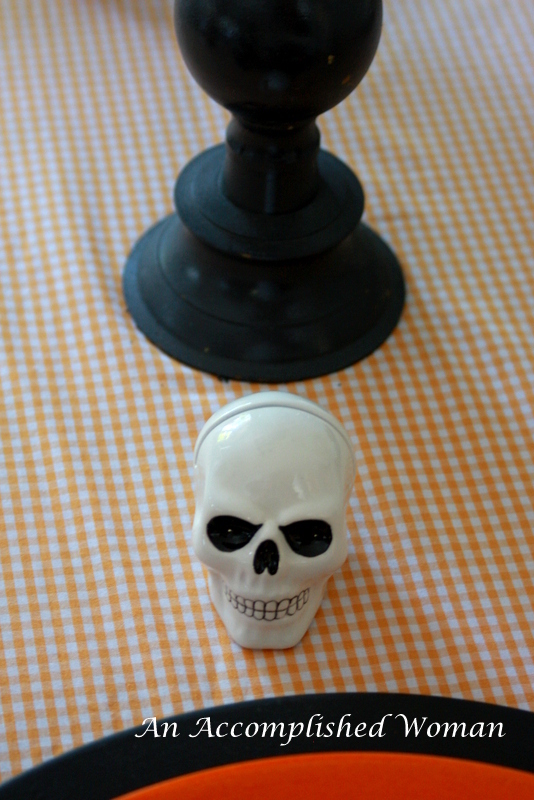 Salt and pepper shakers are always so charming on a table. I made it a goal to fill all the shakers I own... not an easy task. 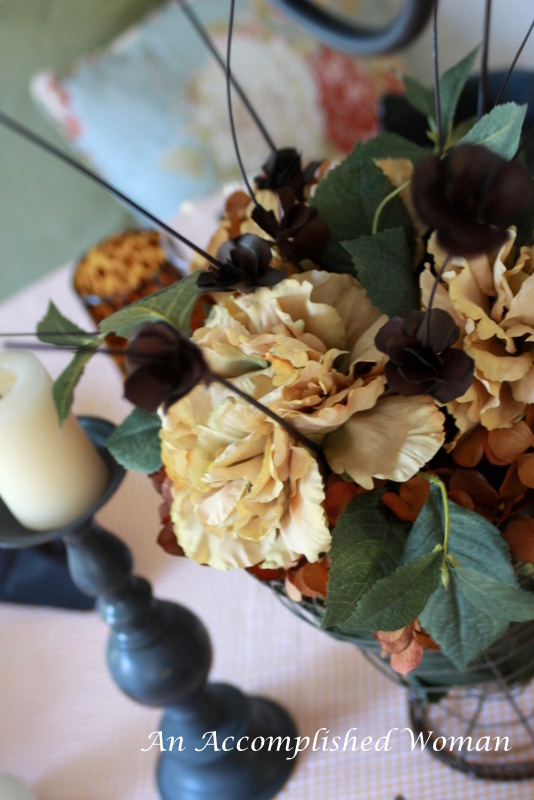 The centerpiece… silk hydrangeas in both the brown and cream. Black roses on these branches. 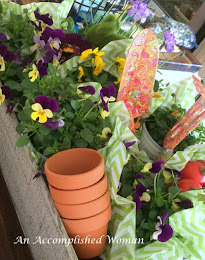 I found them at World Market and cut them down to fit the centerpiece. On a side note… I hate scary Halloween… only sweet Halloween. Love the place card holders.. but a little scary for me. 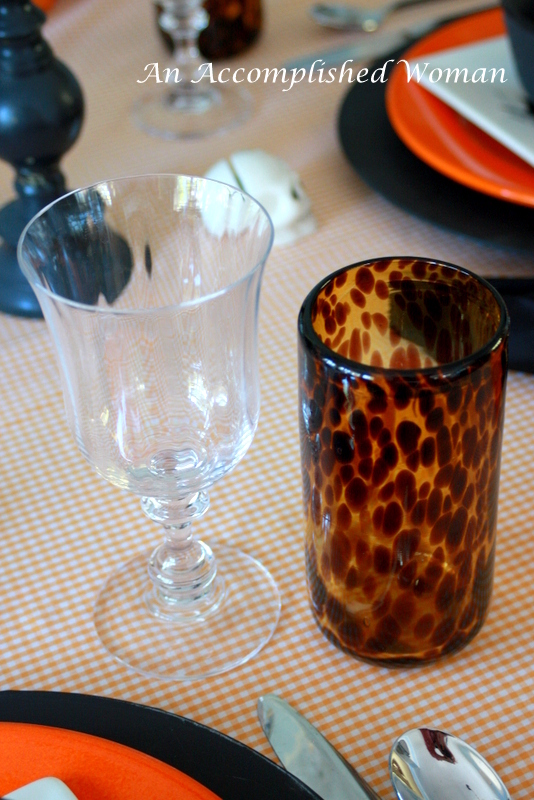 And the napkin rings which were Target finds several years ago. 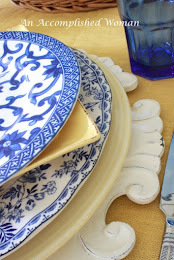 Two napkins give so much color to a table. 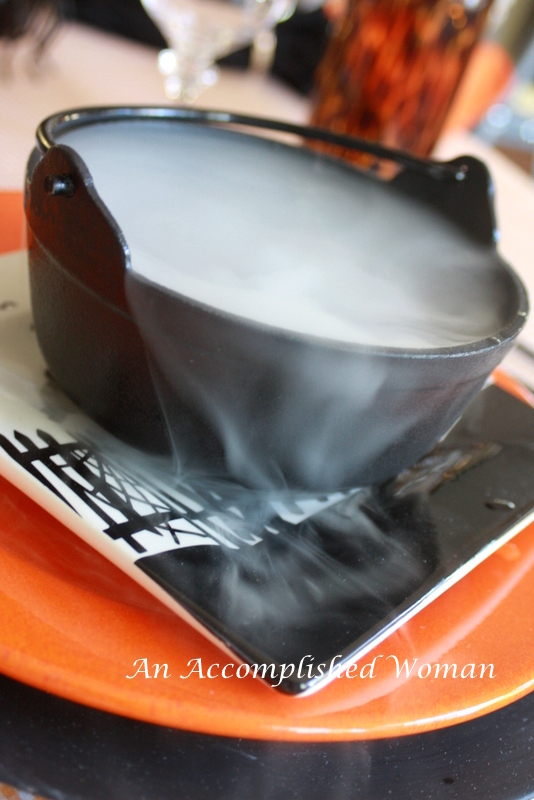 Okay… to my idea… what if I make these individual bowls CAULDRONS. 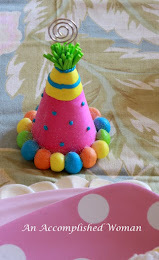 How fun would this be for the kids? 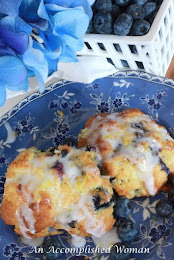 I am joining Susan at Between Naps onthe Porch and her fabulous party. P.S. The big kids loved it too…Thank you for visiting my table. 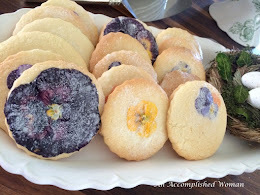 My family loves all the fun ideas and you all inspire me to keep finding new ways to not only feed my family but also in entertaining ways. Fun for adults too! You have collected some great things for setting a Halloween table. Love it! Too adorable! Love the glasses. 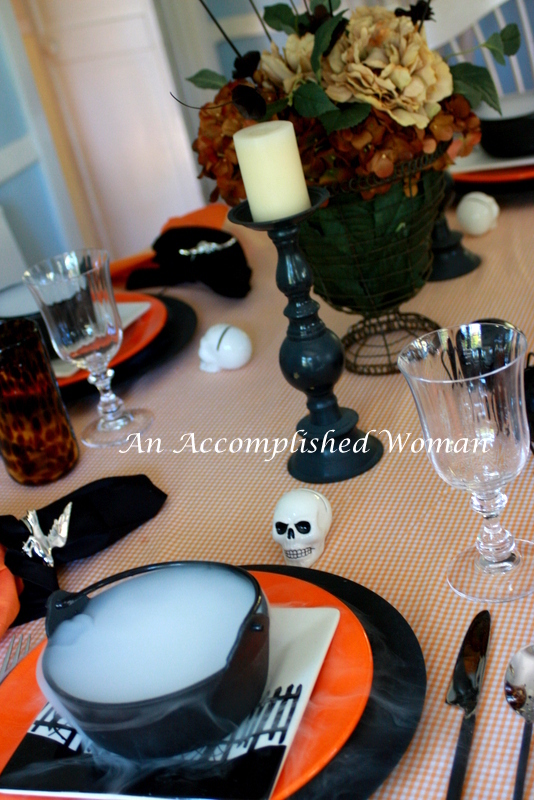 The whole setting is so cute....I used the same fabric on my Halloween tablscape...great mind you know! Thanks for sharing, visiting from Between Naps on the Porch. 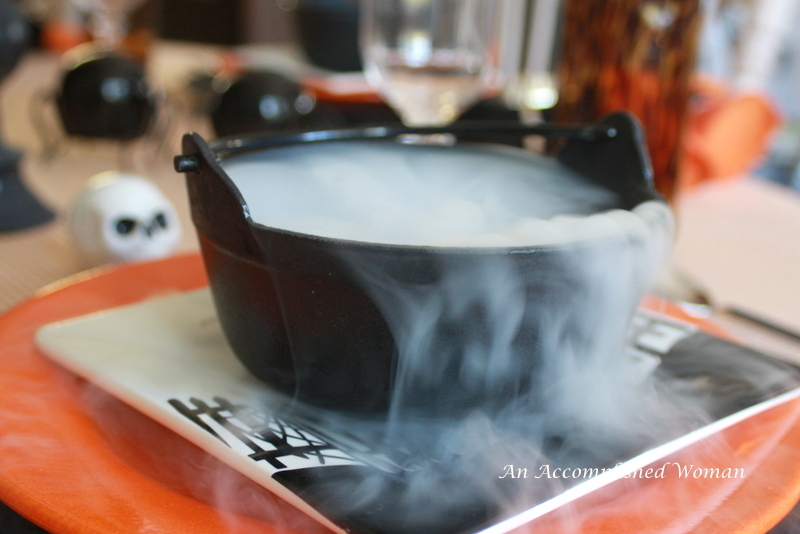 I love the scary fog coming from the little cauldrons. 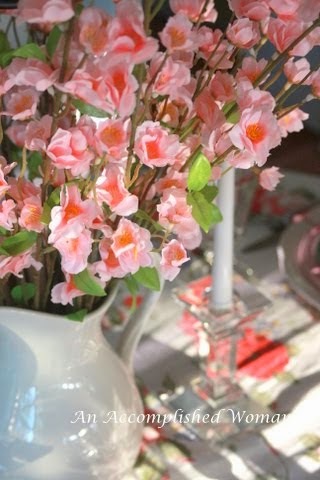 What a gorgeous table. Wow what a great idea with the darling "cauldons" and the dry ice making it a Misty Halloween. 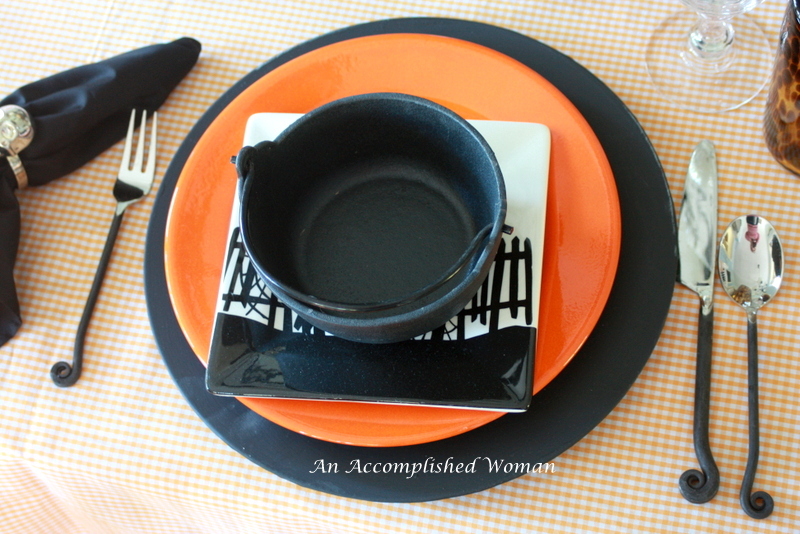 I love how you incorperated the cute accessories with the Halloween plates. 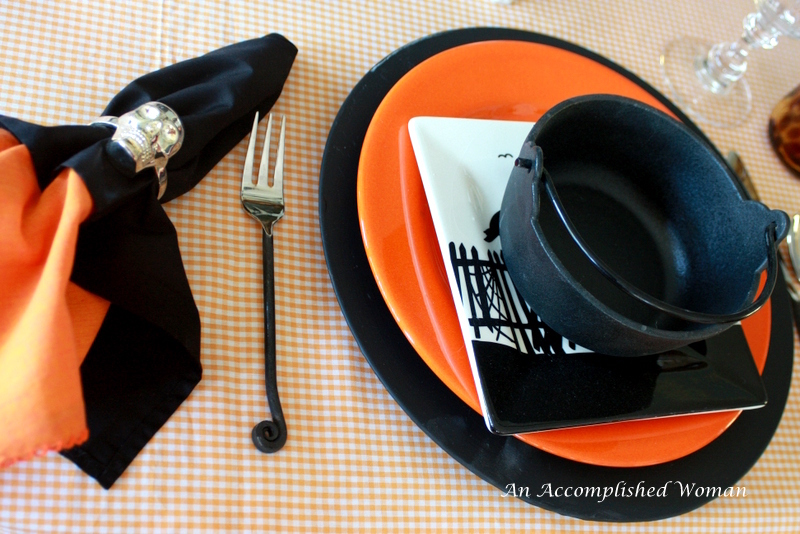 My red square plates for Halloween came from Kroger this year and I love their seasonal glassware.